Surface of component, during quenching, cools rapidly and centre cools slowly; therefore phase appearing at the surface and centre are likely to be different. This results in non-uniform volume changes. The overall effect of non-uniform cooling and non-uniform volume changes is to cause heavy distortion and cracking of the components. The cracking may result during quenching or sometimes after quenching, if tempering is delayed or in the easily stages of tempering. 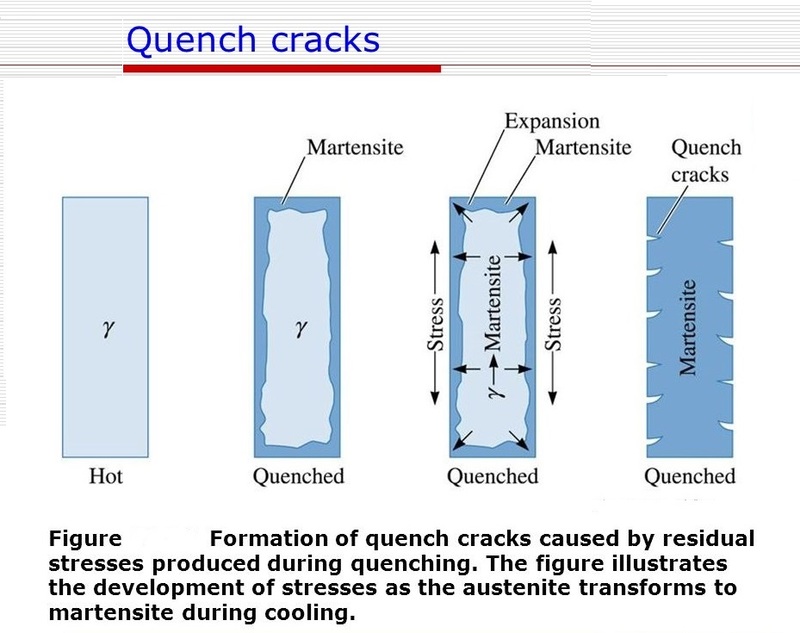 Over heating: During the austenizing portion of heat treatment cycle can coarsen normally fine grained steels. Coarse grained steels increase hardening depth and are more prone to quench cracking than fine grain steels. Avoid over heating and overly long dwell times while austenizing. Time delay between hardening and tempering operations. Improper design: Sharp changes of section, lack of radii, design of keyways, holes, mass-distribution, and non-uniform sections. Improper quenchant or medium: Water, brine or caustic will get the steel "harder". If the steel is an oil hardening steel, the use of these overly aggressive quenchants will lead to cracking. Excessive amount of non-metallic inclusions in steel. Age hardening is a type of heat treatment used in metallurgy to strengthen metal alloys. It is also called precipitation hardening, as it strengthens metal by creating solid impurities, or precipitates, in the alloy that prevents dislocations in the alloy's crystalline structure. Its name comes from the point in the hardening process in which the metal is aged, either by heating it for an extended of time or keeping it stored at a lower temperature for an extended period before use so that these precipitates can form. This treatment is used on malleable alloys, such as those made from nickel, magnesium, and titanium, as well as some types of steel. In first stage an unstable condition is produced by the formation of a supersaturated solid solution. In this state, there is no appreciable change in physical properties and the alloy remains soft and ductile. Metal undergoing age hardening is heated to a high temperature, which varies according to the materials being used and the desired properties of the final result. For example, maraging steel is heat treated at about around 1510 (about 820). Alloying materials are added and allowed to diffuse through the metal until the heated metal is supersaturated with them, meaning that the amount of these materials dissolved in the metal is higher than would be possible for a solid solution at room temperature. Next the metal is aged. 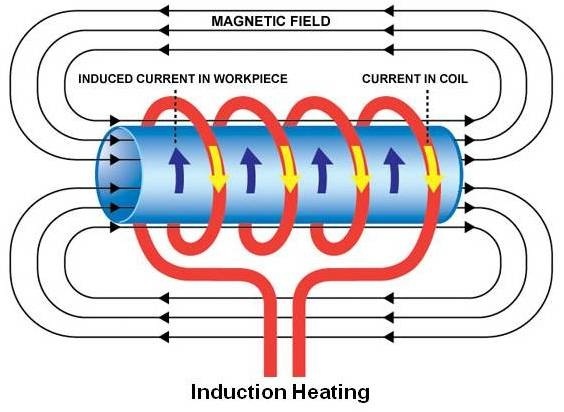 In some alloys, this is done by keeping the metal heated for several hours at a temperature lower than that of the initial phase but still much hotter than room temperature. Other alloys are stored for days or weeks at room temperature. At lower temperatures, it is no longer possible for all of the alloying materials to remain dissolved in the supersaturated metal, and so some of it under goes precipitation and separates from the solid solution, becoming impurities spread throughout the metal. The temperature at which the aging process occurs affects how this precipitation occurs, and so influences the mechanical properties of the resulting alloy. These impurities created by the hardening process strengthen the metal by interfering with the movement of crystallographic defects called dislocations, which result from misalignment in the atoms that from the metal's crystalline structure. Dis locations make metal more vulnerable to being irreversibly bent by outside forces. Their resistance to dislocation gives age-hardened alloys high yield strength and the ability to resist permanent deformation when under heavy strain. Alloys created by the age hardening process have many uses, especially in applications where high strength and good performance at high temperatures are needed. Maraging steel is used in engine parts and in the construction of missiles and rockets. Age-hardened aluminium alloys made with metals such as nickel, copper, and zinc have frequently been used in the construction of aircraft. The alloy Rene 41, made from nickel alloyed with molybdenum, titanium, chromium, and cobalt, is used in applications involving extreme strain and temperature, such as jet engines. This method is the oldest. The steel to be carburized are packed in metal boxes, or pots completely surrounded by the compound, boxes that are usually made of a heat resistant alloy. The boxes are sealed with clay to exclude air and are placed in an oven, or furnace, where they are heated to temperature of between 900°C and 950°C , depending on the composition of steel. 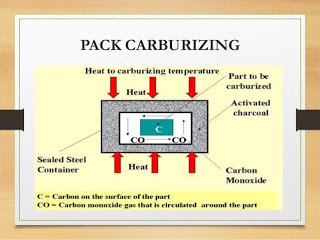 The carbon from the carburizing compound soaks into the surface of the hot steel to depth which depends on the time that the box is left in the furnace, so that the low-carbon steel is converted into high-carbon steel in the form of thin case. The internal section of the steel, and any parts, which have been protected by tinning, however, remain unaffected, the result being a piece of steel with a dual-structure. The steel is allowed to cool slowly in the box. The steel is then removed from the box and reheated to a temperature just above its critical point, or appropriately 915-925°C for fine grain steel, followed by quenching in water, brine or oil. This hardens the skin and at the same time refines the core. 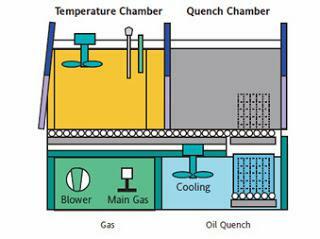 Smaller articles and thin sections are heated to a lower temperature in order to avoid distortion. The steel is usually given a second heat treatment at about 760-780°C, in order to improve the ductility and impact resistance of the core and case. Small parts and single jobs are often carburized by heating them in forge, and covering them with a carburizing powder when the metal has reached a bright red heat. 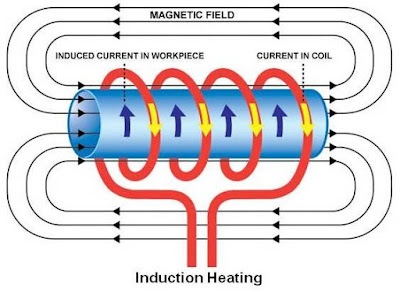 The carburizing compound melts and flows over the surface of the metal, which is then returned to the forge and maintained at a bright red heat for sufficient time to allow the carbon to penetrate the surface, quenching then follows as usual. Many commercial 'carburizing' compounds are available in suitable mixed form. Among the ingredients, combined in different percentages, are powdered charred leather, wood charcoal and horn. Wood charcoal is very largely used, although its value varies with the type of wood. Hickory gives the best results and a normal rate of penetration gradually decreases and ceases after eight hours. 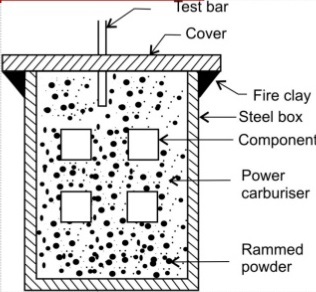 Wood charcoal gives the slowest rate of penetration of any of the carburizing materials. It is another method of extra carbon into the surface of the steel; in this case by heating the metal in a furnace into which a gas which is rich such as methane, propane, butane is introduced. In gas carburizing, the gas may be generated from suitable liquids, as done in certain processes, or the gas such as methane or propane may be led directly into the container in which the work is placed. It is necessary to maintain a continuous flow of carburizing gas into the furnace, and to extract the spent gas. Some city gasses are quite suitable. Some source of oxygen is necessary for best results, either as air or CO2, but usually it is not necessary to add any oxygen. The horizontal, rotary type of gas carburizing furnace has a retort of muffle which revolves slowly so that the parts are rotated in the steam of gas; this is suitable for smaller parts such as ball and roller bearings, chain links, pins, axels and so on. Carburizing gas led into the retort, and the exit gas is burned. Case depths in relating to time and temperature. Larger parts are usually carburized in a vertically rotary furnace, in which gas is given a swirling rotary motion so that it circulates around the parts. The nature of the nitriding process used to obtain a case hardened is very different from that of the carburising process. Nitrogen, instead of carbon, is added to the surface of the steel. Carbon does not play any part in the nitriding operation but influence the machinability of steel. The temperature used in nitriding are much lower than those used in carburising and below the critical temperature of the steel. Simple carbon steels, which are often used for carburising are not used for nitriding. Steels used in the process are specially alloy steels. With the nitriding developing rather thin cases, a high core hardness is required to withstand any crushing loads. High tempering temperature call for a steel with a higher carbon content in order to develop this increase in core hardness. In addition to higher carbon content various alloying elements are called for in the steel to bring about an increase in the formation of these nitrides. Aluminium seems to display the strongest tendency in the formation of these nitrides. Chromium, molybdenum, vanadium and tungsten., all being nitrides former, are also used in nitriding steels. Nickel in nitriding steels hardens and strengthens the core and toughens the case but slight loss in its hardness. Better retention of hardness at elevated temperature. Greater fatigue strength under corrosive conditions. Less warping or distortion of pans treated. High endurance limit under bending stresses. Greater resistance to wear and corrosion. Necessity of using high alloy containers to resist the nitriding. High furnace costs due to the long lime of treatment. Necessity of using special alloy steels. Flame hardening is a surface-hardening method that uses an oxyacetylene flame to heat treatment the surface of the metal. Flame hardening can be performed on only medium or high carbon steel or cast iron. When flame hardening is applied to steels with over 70 points of carbon, extra care must be used in order to prevent surface cracking of the high-carbon steel. The process is based on the rapid heating of the outer surface of a ferrous metal to or above its transformation temperature.The minimum distance that the oxyacetylene flame must be held from the base metal is approximately 9/16 inches. If the oxyacetylene flame is closer than 9/16 inches., the base metal will be deformed by the flame. The metal is moved rapidly under the flame, allowing the flame to heat the base metal only on the surface. This surface heating creates two heat-affected zones, a primary heat-affected zone, where the transformation of the metal has taken place, and a secondary heat affected zone, where grain growth has been developed or where the grains have been enlarged or decreased by the application of heat to the base metal. Immediately after it is heated, the metal is subjected to a quenching spray, generally water, that hardens the metal area that has undergone transformation. The depth of hardness depends entirely on the hardenability of the material being treated since no other elements are being added or diffused, as in case hardening. With proper control, the interior of the metal will not be affected by this process. Often an average application of this process involves heat treating a complete piece to a certain specified softness or toughness. The exterior then may be flame hardened so that the finished piece resembles an item that has been case hardened. It is quick and the hardening is restricted to parts which are affected by wear. 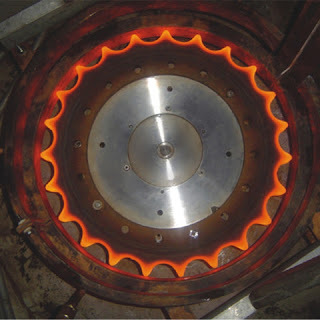 Fig shows, a flame hardening of gear teeth. A flame from an oxy-acetylene or similar burner is played on to the teeth so as to arise temperature rapidly above the hardening temperature. Hardening results when the austenised surface is quenched by spray that follows spray. Steel can be classified into (1) Plain carbon steel, and (2) Alloy steel. Plain carbon steel is that steel in which the only alloying element present is carbon. In alloy steel, apart from carbon, other alloying elements like chromium, nickel, tungsten, molybdenum, and vanadium are also present and they make an appreciable difference in the properties of steel. Before we go further, readers must note that in steel, besides iron and carbon, four other elements are always present. These are S, P, Mn ans Si. Removing these elements from steel is not a practical proposition. However, the effect of sulphur and phosphorous on the properties of steel is detrimental and their percentage is generally not allowed to exceed 0.05%. Similarly, the usual percentage of manganese ans silicon in steel is kept below 0.8 and 0.3%, although their effect is not determinantal to the properties of steel. In fact, manganese counters the bad effect of sulphur. The presence of these four elements to the extent indicated does not put plain carbon steel into the category of alloy steel. 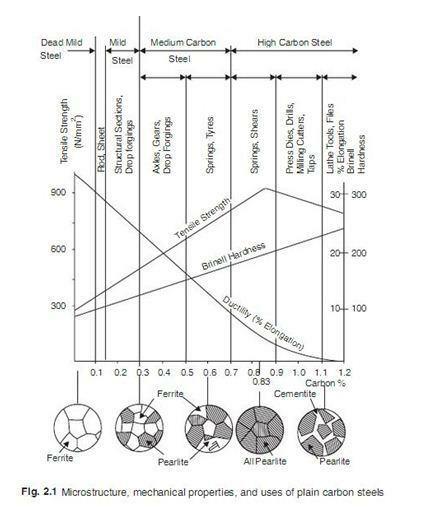 However, if higher percentages of Mn and Si are intentionally added to steel in order to alter its properties, then the resulting steels come within the category of alloy steels. (iv) High carbon steels having carbon content above 0.7% (the higher practical limit of C% is 1.3%). As the carbon percentage increases, the strength and hardness of plain carbon steel increases while ductility decreases. Reference is invited to Fig. 2.1. which shoes the effect of increasing carbon percentage on certain mechanical properties of carbon steels. Silicon: It may be present in cast iron up to 4%. It provides the formation of free graphite which makes the iron soft and easily machinable. 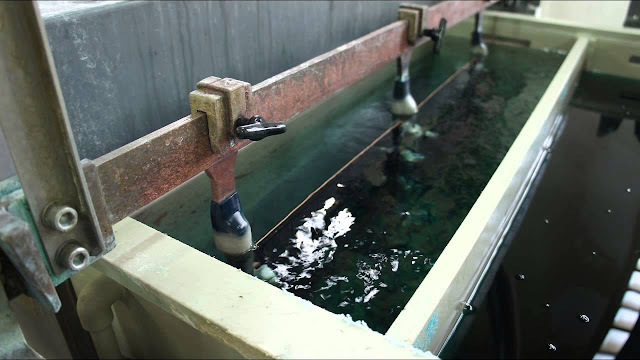 It also produces sound castings free from blow-holes, because of its high affinity for oxygen. It reduces the melting point but enhances the percentage content of uncombined carbon. Sulphur: It makes the cast iron hard and brittle. It causes red-hardness of metals (Brittleness at high temperatures). Since too much sulphur gives unsound casting, therefore, it should be kept well below 0.1% for most foundry purposes. Manganese: It makes the cast iron white and hard. It is often kept below 0.75%. It helps to exert a controlling influence over the harmful effect of sulphur by forming MnS (which is not injurious in small quantities). Phosphorus: It aids fusibility and fluidity in cast iron, but induces brittleness. It is rarely allowed to exceed 1%. Phosphoric irons are useful for casting of intricate design and for many light engineering castings when cheapness is essential. It gives rise to cold shortness (Brittleness at ordinary temperatures). Grey cast iron is charecterised by presence of a large portions of its carbon in the form of graphite flakes. Although grey iron is often defined as steel containing graphite, its properties are far different from those of steel. 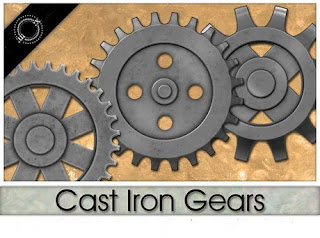 As already mentioned, Grey cast iron is very widely used in the form of castings. In fact, it is so widely used that the term cast iron has come to mean grey cast iron. If a finger is rubbed on a freshly fractured surface of grey cast iron, the finger will get coated with grey color due to the graphite present in the cast iron. grey cast iron has good compressive strength, but is weak in tension. It is relatively soft but brittle. It is very easy to machine and the resulting surface finish is good. It is self lubricating due to the presence of graphite and has good vibration damping characteristics. Compares to steel, it resists corrosion. White cast iron has 2 to 2.5% carbon and most of it is in the form of cementite. If molten cast iron is cooled very quickly and its chemical composition lacks graphite-promoting elements like Si and Ni, then carbon remains in combined form as . However, white cast iron does not have much use as such. It is very hard and shows white colored fracture. Highly resistance to wear. Due to its poor fluidity it does not fill the mould freely. Only crushing rolls are made of white cast iron. But it is used as raw material for production of malleable cast iron. Used for parts subjected to excessive wear. Malleable cast iron is manufactured by a complex and prolonged heat treatment of white cast-iron castings. Grey cast iron is brittle and has no or very little elongation. Malleable cast iron castings loose some of grey iron's brittleness and become useful even for those applications where some ductility and toughness is required. (Note: 'molten iron' is a name given to cast iron whose structure shows part grey and white cast iron characteristics). Malleable cast iron is of two types: 1. Black hearth and 2. White hearth. Malleable cast iron can be obtained by keeping temperature and time comparatively of high values. It is used in differential and steering gear housing, brake pedals, tractor springs, hangers and washing machine parts. This cast iron is also known under the name of spheroidal graphite cast iron. If a little bit of magnesium (0.5%) is added to molten cast iron, the graphite, which is normally present in grey iron in the form of graphite flakes, changes its shape to small balls/ spheres and remain distributed throughout the mass of cast iron. This change in the shape of graphite particles has a very big effect on the properties of resulting castings and their mechanical properties improve considerably. The strength increases, yield point improves and brittleness is reduced. Such castings can even replace some steel-components. The properties of cast iron can be improved by addition of certain alloying elements like nickel, chromium, molybdenum and vanadium, etc. Among the alloying elements, nickel is predominating alloying constituent whose addition to the extent of 0.5 to 1.5% avoid the tendency of chilling and hard spots. 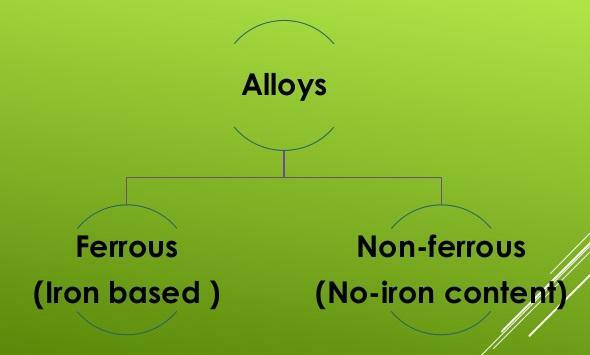 Alloying cast irons have higher strength, heat-resistance and grater wear-resistance etc. Such enhanced properties increase the application and uses of cast irons. I.C. Engine cylinders, cylinder liners, piston rings etc, are made of alloy cast irons.